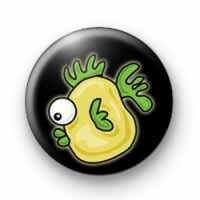 Yellow fish button badge in black with a really cute illustration of a yellow fish with big green lips and matching fins & gills in green. This cartoon style fish badge is always popular with teachers & students learning about marine biology & we sell lots to schools teach marine conservation and ocean studies. These are perfect for anyone who loves the seaside & marine life. They are also great if you are taking the kids on a summer holiday to the seaside or out on a boat or ship this summer. Standard 25mm fish badge made by hand in our family workshop. We send our badges to customers all over the world & offer free delivery if you order a large number of badges. We also have a next day delivery option available for orders within the UK, perfect for those last minute badge orders.